You take with the good with the bad. This week has been a crap week to be pregnant (for me), but a great week to be a woman (for me, as well as the bunch of us). "If you haven't experienced the glass ceiling, you haven't gone far enough in your organisation yet." But even better news for females everywhere was the news that Hillary Clinton had clinched the Democratic nomination to run for President in the US elections this November. Overnight Barack Obama officially endorsed Hillary Clinton to be his successor as President of the United States. Here's hoping she wins, because the Trump just seems like a terrifying prospect for the role. But Hillary's spin at campaigning for President (her second - she ran against Obama in 2008) has shown an ugly side to some of the attitudes that persist on how we treat women and expect them to behave. Some of my male friends and male commentators in the media who say "Bernie would just be better" have no reason for backing up their statements, and I can't help but wonder why. Campaigning is not succeeding. It’s asking for success, and for power. To campaign is to publicly claim that you are better than the others (usually white men) who want the same job, and that a whole lot of people should work to place you in a more powerful position. 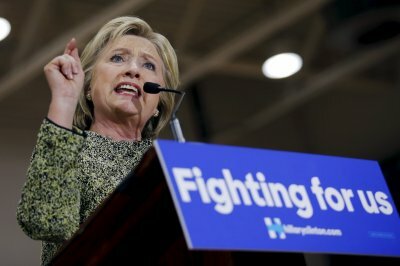 In other words, campaigning is a transgressive act for women... Women who put themselves forward in the same assertive, confident style as men are routinely found pushy, “bitchy,” or unlikable, and professionally penalized for that, too. It's equally saddening and frustrating to read those words. Worse, to know that they're probably pretty true. Males (and a stack of females too) can't articulate why "Bernie would be better", so one can only assume the roots of this view lie somewhere in this gender bias. But by pushing forward, gaining the nomination and PLEASE DEAR GOD the presidency, hopefully Clinton's hard work can speak for itself - and in doing so kick start a global discussion around women, their potential and expanding that limited box women so frequently get packed into.